Weighty Matters: Scariest Fries Ever? Came across these beauties on the blog Supersized Foods. For just $8 you can start a slow death by fries....but oh, the cheesy, potato-y goodness. 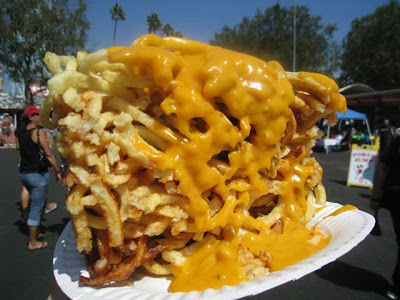 For more fried foods available at the LA County Fair (where this shot was taken), head over to the blog that dropped this fry bomb - LAist where they have the photo evidence of deep fried pretty much everything you could imagine from frog legs, to twinkies to of course bricks of cheese fries. Anyone care to take a guess at the calories? Do you think they serve a kids' size?